What if you gave your kids a shaker full of deliciously sweet sprinkles and let them shake it onto anything they wanted? Think they’d love it? And what if those sprinkles were full of organic wholefoods and all the vitamins, minerals, antioxidants and other nutrients that come with them? Think you’d love that? 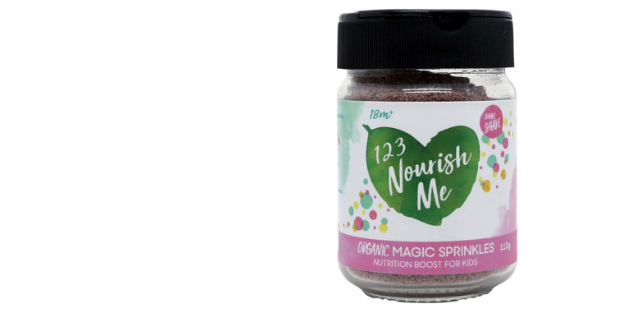 That’s what 123 Nourish Me’s Magic Sprinkles are all about. Bursting with the flavours of superfood berries like acai, cranberry and goji and the natural low-calories sweetness of stevia and monk fruit, they’re great on breakfast cereal, porridge, yoghurt and ice cream – and you can trust your kids to come up with a few less obvious flavour combos too!